Let your heartbeat quicken with this exquisite ring from Apples of Gold. Welded of 14K white gold, this band channels Celtic love with its intricate design. Lush lines sweep and arc to divine white gold hearts in the center of the band. Each heart is connected, creating an encircling pattern that isn't just carved into the gold, but raised from the band to truly set the motif apart. 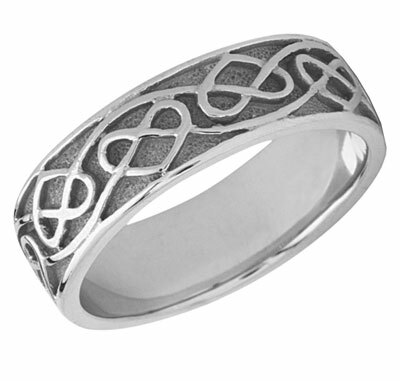 The band is edged with white gold lines, providing beautiful framework for this lovely Celtic-inspired design. Band weighs between 9-12.5 grams (depending on size). We guarantee our Celtic Heart Wedding Band in 14K White Gold to be high quality, authentic jewelry, as described above.